Have you received a letter, postcard, or catalog in the mail and said to yourself, “Why are they sending me this?” Perhaps you live in an apartment, and it’s a special offer for tree pruning services. Maybe you pick up your mail and as you’re shuffling through it, you see the name of the previous homeowner and catch yourself wondering, “He moved over two years ago—why did they send it here?” Or, you hear from your parents how distraught Aunt Betty was when a letter showed up addressed to Uncle Larry, who passed away 18 months ago. Scenarios like these can be tracked back to mailing lists. At IWCO Direct, we strongly believe that preparation and planning are key to the success of a direct marketing campaign, and preparation begins with identifying the right target audience. The more you know about your audience, the better you can target your offer to the right mailing list. Knowing your audience includes knowing your current customers and using that information (or customer profiles built from that information) as a roadmap to help identify the best mailing lists. Demographics such as type of residence, gender, age, income, marital status, children, purchase history, etc., should all be considered, as well as psychographic data like interests, attitudes, values, and personality traits. Demographic data is the starting point, while psychographic data can help you drill down even further in this age of increasing segmentation. For example: you may be trying to reach two different men—both married, both earning $80,000 per year, both with two children. However, one is a weekend warrior whose passion is rock climbing, and the other prefers bird watching. Clearly, these men probably purchase very different products and services to support their recreational activities—so psychographic data can help you distinguish those consumer characteristics beyond just simple demographics. IWCO Direct works with clients from a number of verticals to target their exact audience and choose the right mailing list—and that sometimes means factoring in more targeting criteria than what might be obvious. Here’s another example: A healthcare system searching for new patients will generally want to address its messaging to the female head of the household, because she’s typically the family healthcare decision-maker. Once a decision has been made on a healthcare provider, it’s challenging to get someone to switch. So, in this case, an effective direct marketing strategy might be to rent a new mover list. Those families that are in the process of moving to town will no doubt be looking for a new family physician, and reaching a new mover at this time may help you secure a patient for life. This rule states that 40% of your success or ROMI is dependent on the effectiveness of your mailing list. Another 40% is dependent on how relevant and compelling your offer is, and the remaining 20% can be attributed to the creative. Don’t get me wrong—there’s obviously overlap to this hard and fast rule. Learning as much as possible about the target audience of course helps you structure the offer correctly and fuels the creative. However, too often direct marketers wrestle with the offer and search for the flashiest and most dazzling creative, only to rush to select a list at the 11th hour. With at least 40% of your success attributed to the list, don’t let your list selection become an afterthought. Invariably, you’ll reach the point when two (or more) mailing lists seem very similar. How do you know which one will lead to a better ROMI? Here’s a thought: Why not select both and test the lists against each other? Just be sure to keep everything else the same between the direct mail packages so you’re able to attribute the results to the only difference (the list source). IWCO Direct conducts a number of tests like this for our clients and on more than a few occasions, we’ve found a significant response difference between lists that appeared very similar—sometimes as much as double the response rate. 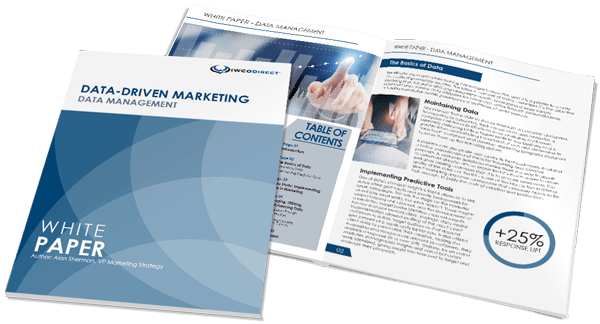 The right mailing list can make or break even your best direct mail campaigns. With reports indicating 40–60% of your direct mail marketing effort’s success hinges on the mailing list, it makes quite a bit of sense to be sure to invest the appropriate amount of time in researching and selecting the right list. You might even say your ROMI depends upon it. Contact us if you’re struggling to identify the best marketing list(s) for your product or service. We’re here to help.